Studio' RaMa > Projects > Waarom is het hier zo stil? Waarom is het hier zo stil? (Why is it so quiet here?) takes you on a visit to Museum Boijmans Van Beuningen through the eyes and thoughts of the artist Jan Rothuizen. Jan Rothuizen is a draughtsman. 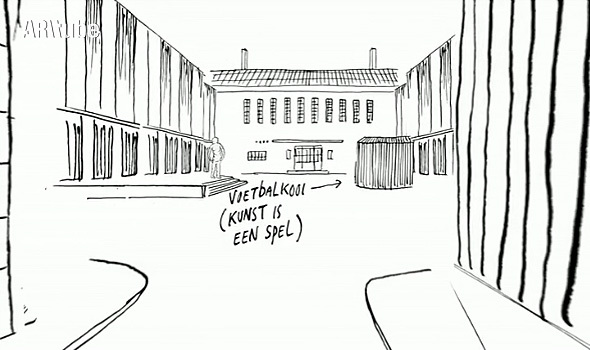 He is famous for his drawings in the daily newspaper De Volkskrant and elsewhere, in which he records his detailed observations of a particular place in words and images. Waarom is het hier zo stil? is his first animated film. Contribution to Waarom is het hier zo stil? I was asked to create a mainly non-musical soundtrack for the film. On the one hand, the viewer had to feel like he really was walking through the museum. On the other hand, the surrealism of the drawn world had to be reflected in the sounds being used. So for the environmental sounds I went to the museum itself to record the sounds of the rooms that are featured in the film. I filled in the rest with sounds that complimented the visuals, and at times made the art in the museum feel alive.